Prime among these are the calligni, also known as dark folk, who reside in the depths of the Darklands beneath Golarion's surface. 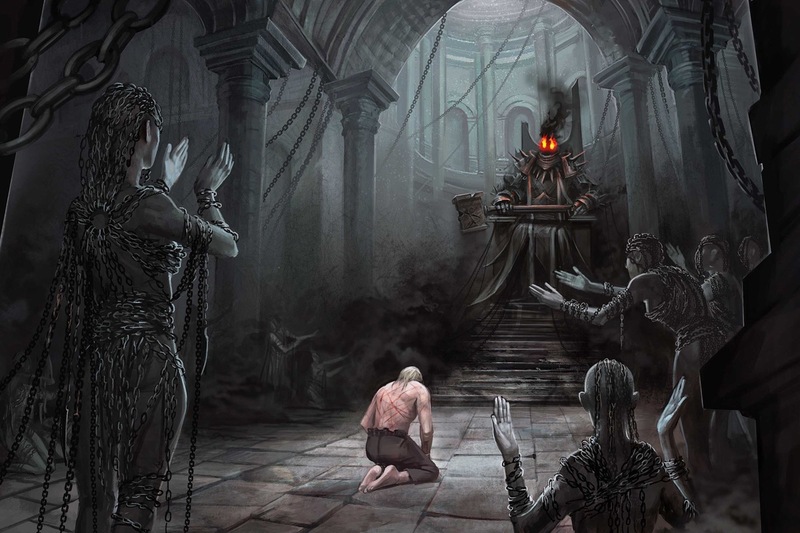 Ruins of Lastwall features three calligni figures who can make for a variety of challenging encounters for parties of low- to mid-level. The Small common Calligni Creeper showed itself way back in September and today its companions, the Small common Calligni Slayer and Medium common Calligni Stalker. While this leaves a few callignis out of the mix (dancers and callers, mostly), it should allow GMs running the newly released Pathfinder Module: Cradle of Night to represent some of the allies and enemies in the adventure with more accurate miniatures. 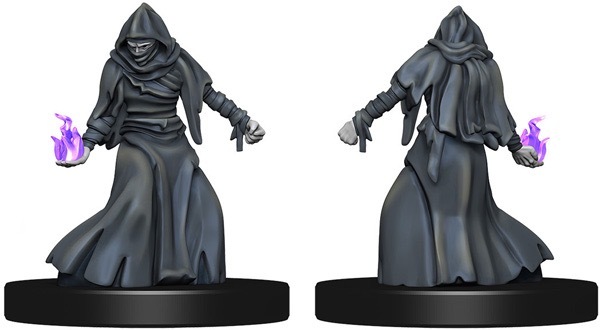 Rounding out our Darklands inhabitants for Ruins of Lastwall is the Tomb Giant, a Large uncommon figure representing a member of this race of subterranean necromancers. It's a good thing they aren't big on cooperating with other races, because they would be a terror on the battlefields of Lastwall on the side of the Whispering Tyrant! All three of the most recent previews of the set have shown off at least one outsider, so I guess I won't break that trend. Who better to appear in a blog about darkness than a creature from the Plane of Shadow? Here we have the Velstrac Evangelist, the most common type of kyton in the setting. A Medium common figure, collectors should be able to build quite a squad of these chain-bound (called, appropriately a link and a chain, depending on their exact number). Finally, a piece of dungeon dressing befitting a kyton: a torture rack. Whether you're putting a PC on it to raise the stakes for your players or simply setting one in a deungeon to set the mood and show what sort of inhabitants might live there. That's it for this week, but tune back in next time for an infestation of bugs, bug people, and other squirmy wormies you'll find in Ruins of Lastwall. Until then, beware of the dark! The Dark Stalker & Kyton from the Bestiary are a very nice addition, as is the Dark Slayer, especially at common rarity. I also like the CR 12 Tomb Giant from Bestiary 6, especially since it being an uncommon should give you three in a case to build a minimum size cabal (3-12). I can't quite see the rack clearly, as the image links to the wrong closeup, but it is a staple dungeon dressing and if a medium or small mini really fits on it, it will be great. ... Any chance of it getting sanctioned for PFS play... Soonish? Yus? I have to say that I love the Dark Stalkers. Need to get a couple! A rack! Now that is evocative dungeon dressing! The Calligni look fine, but as they are almost all black robes there isn't much that can go wrong. Same with the Tomb Giants. The kyton is beautiful, and I hope the mini paint job turns out well. It is a pretty simple paint scheme for a mini, so it hopefully will work as a common. That and Return of the Runelords are part of our sanctioning queue, don't worry. We've been knocking out a good number of these projects in the past couple months, so I trust it's coming up soon. Thanks for putting the blog up so fast. The caligni look great, I’m especially happy because this means we get three variations, 5e small creeper and two medium stalkers. A perfect collection. The tomb giant looks good and is curiously another giant I’ve been wanting for some time. Just need Ash giants now! 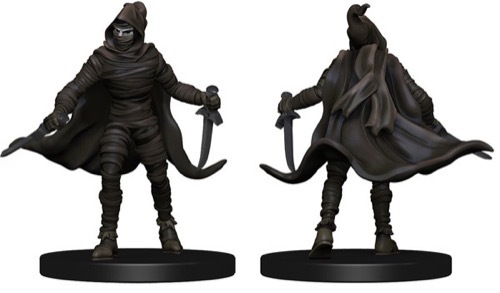 While I think the Kyoto looks awesome, great colour combo and pose, and if the paint is up to the standard footnote he last two sets wizkids produced (these are icons sets though) it will be a nice mini. I just wish we’d got a different Kyton. There are now so many to choose from. The rack is a great addition to the dressing pieces. The more I see of this set the more excited I get. I do like the look of the dark slayer and the evangelist kyton!